Yo! 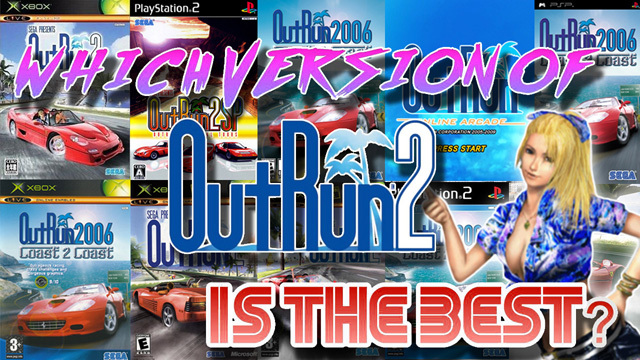 So, I've made a new video where I discuss which version of Outrun 2 (including coast 2 Coast and Online Arcade) I think is the best, out of all the different versions available. Check it out at the following link. Last edited by MrThunderwing on Fri Jan 25, 2019 10:52 am, edited 1 time in total. For my, the best was the PS2 Japan only release OutRun 2 SP, because it gained support for the Logitech wheels of the time, like the Driving Force Pro, feature that was not present on the 2006 C2C PS2 version. Original Xbox Coast2Coast for me. I got into playing it on the 360 but it seems to drop frames or occasionally have slowdown. It is crisper on 360 though. I prefer the first games tracks but the collision detection is a nightmare from what I remember, much more forgiving on Coast2Coast. Btw, does anyone know, is there a way to play all 30 tracks back to back. I thought it was one of the flag and missions but either I can't find it or I was dreaming. dan76 wrote: Btw, does anyone know, is there a way to play all 30 tracks back to back. I thought it was one of the flag and missions but either I can't find it or I was dreaming. There isn't unfortunately. You can do the Original OR2 15 stages in a marathon and likewise the 15 SP stages, but not both together. I enjoyed the video! Don't ask me how, but I never knew Coast 2 Coast was on Xbox. I really thought it was a Sony exclusive, since the only versions I ever saw for sale were PS2 and PSP. Kind of sad that there isn't truly a definitive version, since you need to sacrifice one thing or another no matter which version you go to, but I wind up hopping between original Xbox Outrun 2 and 360 Online depending on my mood. Glad you enjoyed it Toshiko. Japanese is like Spanish, where every vowel always makes the same sound (though regional dialect can under-emphasize them in certain cases, so 'ichi' can sound like 'each' to a foreign ear, for example). So the 'i' would always make an English long 'e' sound. 'Chaihiro' just made me giggle, is all. This is the EXACT same video file, the only difference here is that I uploaded this to my Google Drive first (for the YouTube technical team to so-say download and look at) before I decided to try exporting it into YouTube to see if the correct resolutions would show up this way. I've got a bit of plea here: If you were one of the people who were kind enough to leave a positive comment on it originally, please can you go back and comment again, give it a thumbs up, share it, anything really that'll help it get noticed by the YouTube algorithm to try and help it get noticed, so it doesn't languish in no views hell. Thanks in advance if you do - you're ace!